There has not been a satisfactory way to view the images to preserve the angular relationships until the HinesLab Retinal Diagnostic Station which displays stereoscopic images to provide the point of view as if the ophthalmologist were perched in the patient's pupil, looking around at the very realistic interior of the eye, all in 3D. Macula degeneration, retinitis pigmentosa and diabetic retinopathy can be detected with early examination of the retina. Ophthalmologists use a fundus camera to photograph patients' retinas with a field of view up to 140°. When these pictires are taken stereoscopically much more information is conveyed about the spatial relationships of the veins, floaters and any detachment of the retina. The pictures below were taken with the Topcon NW400 retinal camera which can automate the taking of stereoscopic pairs. The 3-D picture is projected into the concave screen which simulates the interior of the patient's eye. The ophthalmologist wears 3-D glasses and sees the features in the eye in a 1:1 angular relationship, making diagnosis more intuitive. 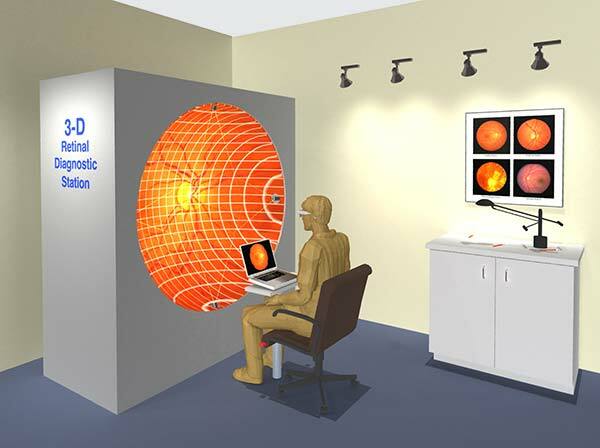 The proposal is that the stereoscopic retinal cameras be located at eye clinics around the country or world, and the images are transmitted to a medical-service bureau with a spherical-screen Retinal Diagnostic Station, where a specialist scans for medical problems, and sends the report back to the eye clinic.